For my dinner last night, I've decided to cook some of my Japanese favourites. I've made the gyōza and aubergine dengaku, both popular dishes regularly found in a Izakaya (Japanese Inn). Gyōza is Japanese style dumplings which originated from Chinese jiaozì (dumplings). It can be found in its many guises such as the Vietnamese Bánh chėo, Shanghai Guōtiē (pot stickers) or Nepali Momo etc, the latter are interestingly normally made with yak or buffalo meat. 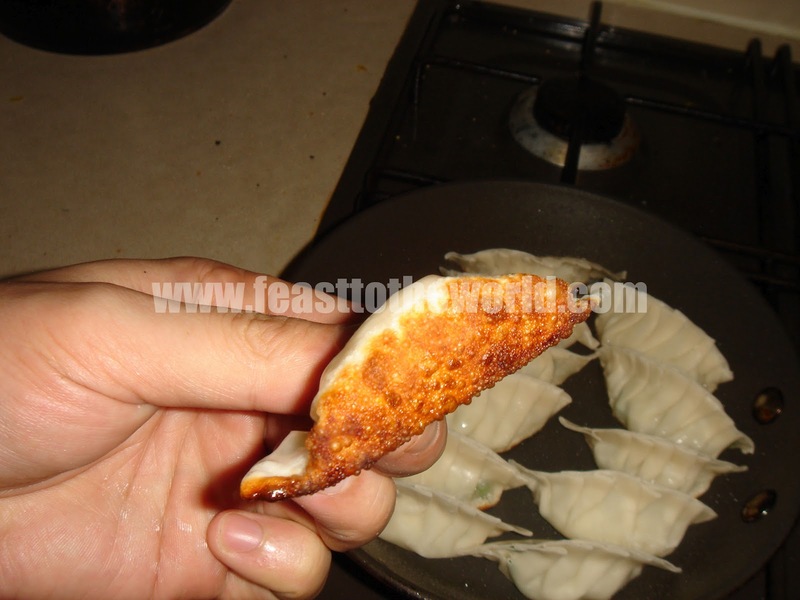 It can either be fried, steamed or boiled, although pan-frying tend to be the more popular method which coincidentally, my favourite too. The gyōza are first pan-fried in a hot pan, water is then added and the pan cover with a lid to allow the steaming process. This create an interesting mix of textures to the finish dish. You get a crispy base, along with a soft tender filling. 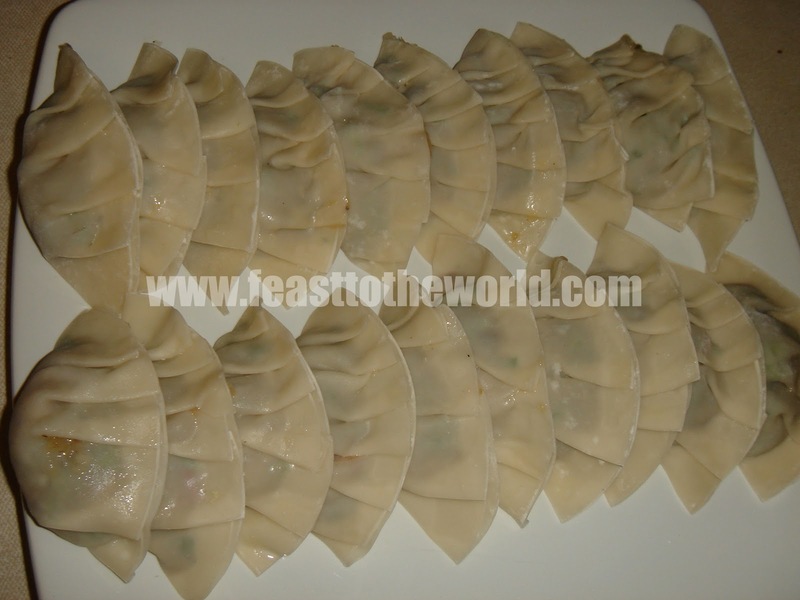 The filling varies but the most common one is made with minced pork, cabbage garlic chives, garlic, ginger and sesame oil. My partner, M, who is not a religious zealot, suddenly decided a while back that Friday will be a fish day. In order to abide by this bewildering obsession, pandering to the idiosyncrasy, I have made prawns and chives version, omitting any traces of meat. 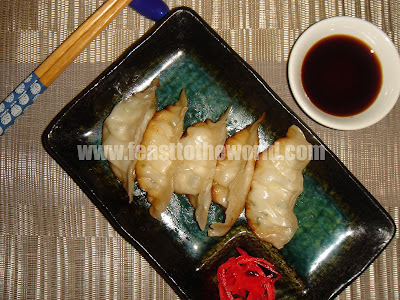 I have however, kept true to the authentic gyoza spirit by serving it with a soy sauce, vinegar and rāyu dipping sauce. Do not be daunted by the filling and crimping of the gyoza. It is surprisingly easier than it looks. Once you have a go at the first couple, you fingers will gradually know its way, like learning to ride a bicycle. Practice makes perfect. 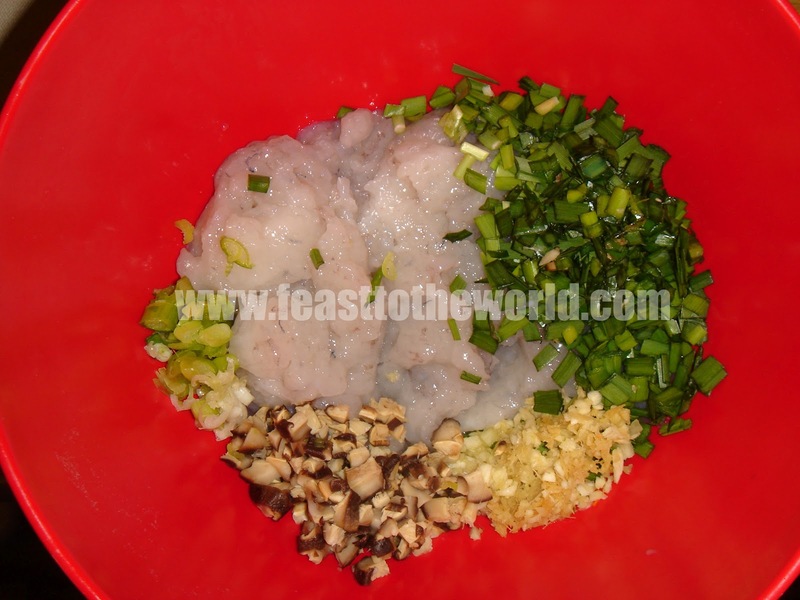 To make the filling, combined all the ingredients in a large bowl and mix well. Set aside for at least 30 minutes for the flavours to develop. 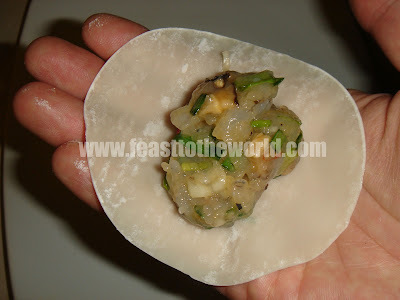 To make the gyoza, put a teaspoon of the filling onto the centre of each gyoza skin, taking care not to over filled this or the wrapper will not seal properly. Moisten the edges with a little water. 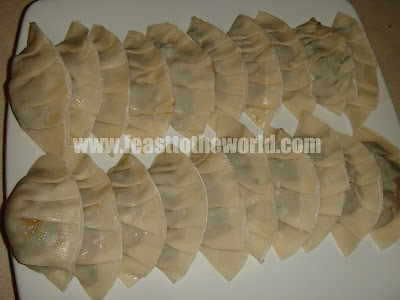 Fold each wrapper in half to form half-moon shape. 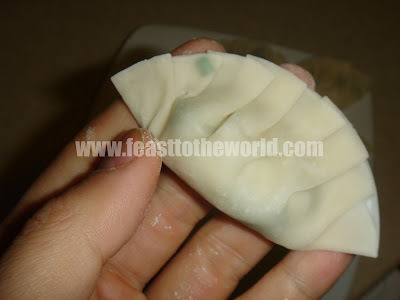 Start sealing the gyoza from one end, gradually moving along the edges, folding and pressing the wrapper to form crimps. 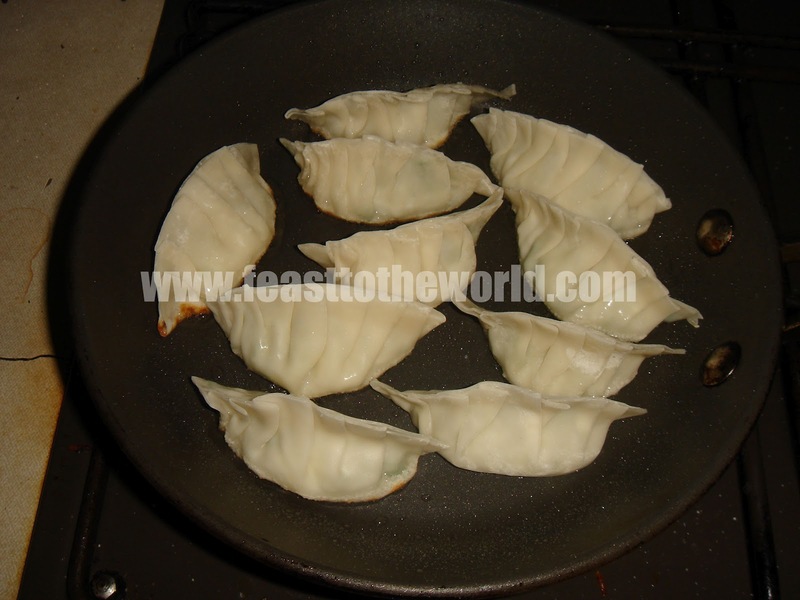 Once sealed, press the gyoza down gently on the work surface to flatten the base. Repeat until all the filling has been used up. Heat a large non-stick frying pan over high heat. Add the oil and swirl to coat. 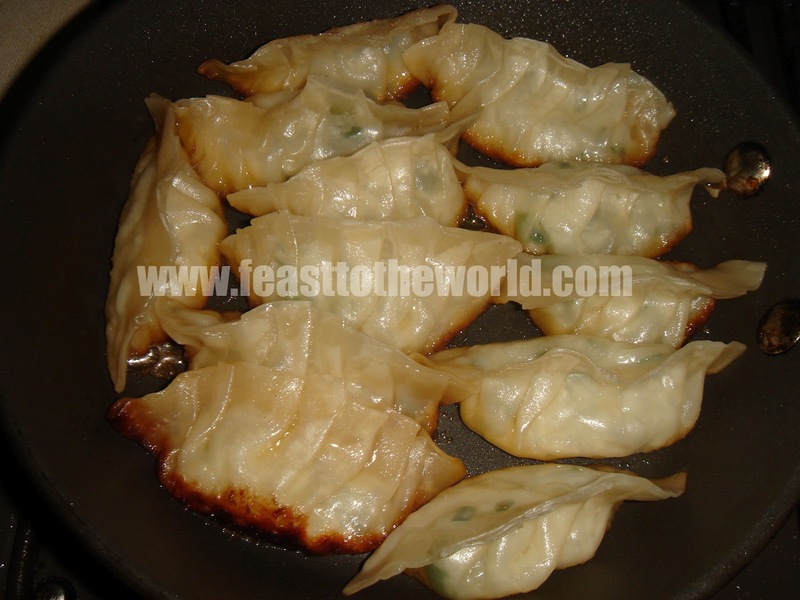 When the oil start smoking, add the gyoza, flattened base side down and cook undisturbed for 2 minutes, until the bases are crispy and golden brown (Do this this in batches if necessary, do not be tempted to overcrowd the pan or they will start stewing instead). Add the water into the pan until the filled part of the gyoza are covered. 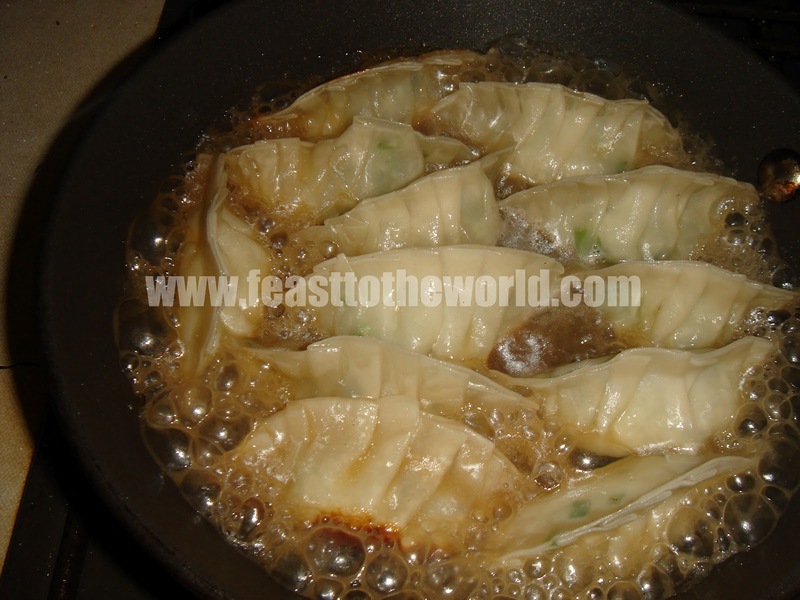 Put the lid on, reduce the heat to low and steam for 8-10 minutes, until all the water has evaporated and the gyoza are cooked through. They should be puffy and yet firm. 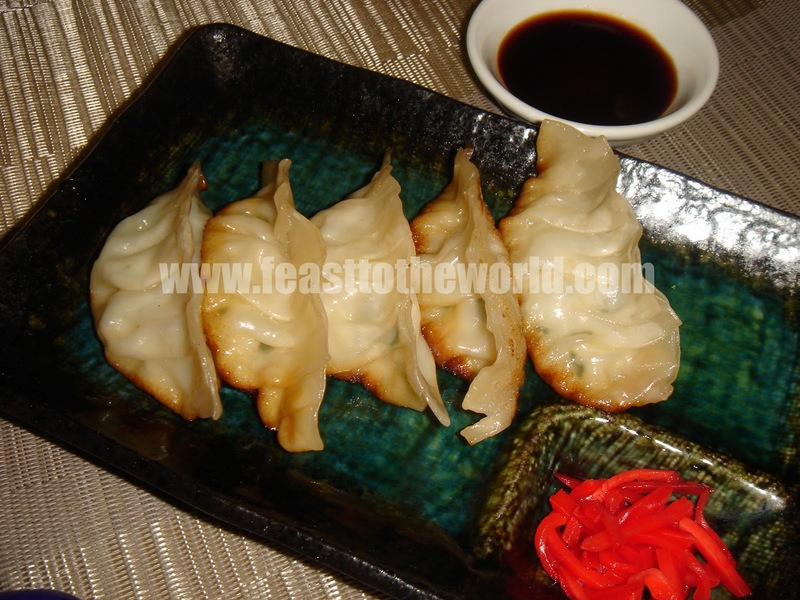 Transfer the gyoza onto a plate and serve with the dipping sauce.